Anyway, Aimee sent me a manuscript of Mothers Ruined a couple of weeks ago for review and I have to say I was quickly hooked, as I had been with the first Dottie story. This book continues her story – she’s moved to a new area and is on maternity leave after baby #3 makes a surprise appearance three weeks early and isn’t quite what they were preparing for. As I’m on maternity leave at the moment, the story line really grabbed me – the trials of trying to make new “mum” friends whilst trying to make time to shower every day, keep the kids presentable (and not green…), find topics of conversation with other mums who you don’t know from Adam (or Eve I guess!) and such like. The main plot line in the novel starts when Dottie starts overhearing the goings on in her neighbours’ houses through her baby monitor. I’ve always puzzled about whether this could actually happen. Luckily we live next door to a retired couple who I don’t think would own such a thing so I think we’re pretty safe! Anyway, I love the way this story line develops and how Dottie uses the conversations she’s overhearing to make new friends in her neighbourhood. She also uncovers the secrets of the street, which eventually get exposed rather publicly – I particularly loved the comeuppance at the end for an especially nosy neighbour! So yet again I’d highly recommend a read to all fellow mums, and I think anyone who likes the sound of a Cecilia Ahern style, fun and enjoyable read. I’m left hoping that Aimee continues to write as I for one will be waiting with baited breath to see what comes next! 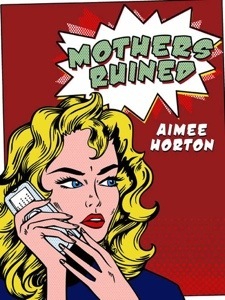 Mothers Ruined by Aimee Horton published this weekend and is available for download on Amazon for the fab introductory price of £1.82. If you love it, and want to know the backstory to Dottie, do check out Survival of the Ginnest. This is also available for download on Amazon for just 77p. Note- I was sent a manuscript for review and have received no payment for this post. All comments are my own.